Figuring out the best way to cook quinoa so that is light and fluffy, each and every time, can be tricky! I have been eating quinoa for years and it took me just about that long to finally be able to cook it without it becoming too mushy or too crunchy. A light and healthy quinoa salad with cucumbers, tomatoes and bell peppers. But now, I have learned the best way to cook quinoa using both on the stove top and my Instant Pot 6 quart Duo that leads to the perfectly cooked quinoa every single time! Over the past several years, I have begun substituting quinoa for many of my rice dishes. We also use it in our No Bake Quinoa Bites Recipe for a quick breakfast meal or a nutritious snack. 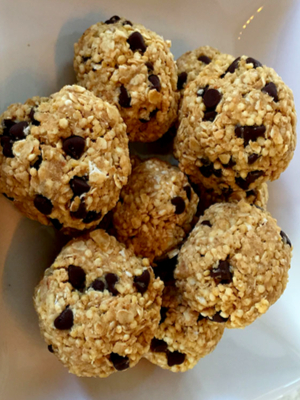 One of our favorite quinoa recipes – No Bake Quinoa Bites. Quinoa is considered one of the healthiest foods around. Not only is it high in protein but it is also one of the few plant foods that contain all 9 essential amino acids. And as a bonus, it is naturally gluten-free! Quinoa is actually a grain crop that is grown for its nutritious seeds. Pronounced ‘KEEN-wah’ this popular staple has been grown for thousands of years in South America. Multi-colored qunioa ready to be rinsed and then cooked. It has gained, and continues to gain in popularity as one of the best super foods readily available to eat all across the world. 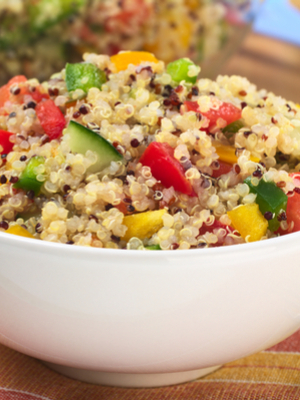 Quinoa comes in three colors – white, red and black. There is no significant nutritional difference based on the color. 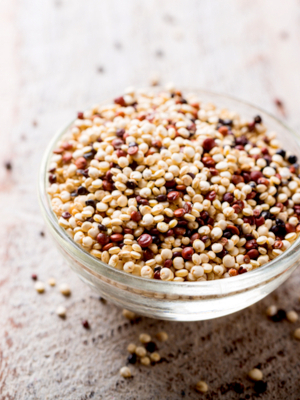 In most common grocery stores you will find two options to purchase quinoa – white or multi-colored. The choice is really up to you and what serving presentation that you prefer. No matter what the color of quinoa that you buy, there are a few secrets on the best way to cook quinoa. 1. First of all, be sure to rinse your quinoa. The outer coating, if left on, will result in a bitter taste once cooked. Be sure to use a fine mesh strainer to rinse your quinoa under cold water to prevent it from tasting bitter. It only takes a minute or two rinse it under cold water. 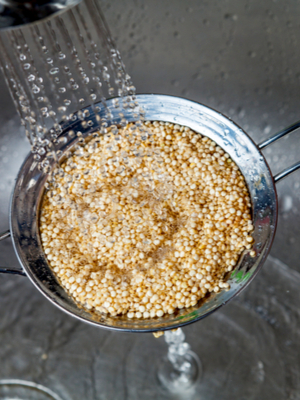 Just be sure to use a fine mesh strainer because quinoa is a small grain and can pass through larger strainers. 2. If you have time, toast your quinoa in a hot-pot or on the saute function of the Instant Pot. No oil is necessary, just heat your pot and when hot add the quinoa. Just stir for 3-5 minutes until you can smell it toasting. The toasted quinoa intensifies the flavor and provides for a fantastic tasting side dish. 3. Depending on your cooking source, the water ratio listed on the instructions of the bag/box may not be the most accurate for light and fluffy quinoa. Using the pot in pot method, quinoa is cooked perfectly in Instant Pot with just one minute of cooking time. When I was learning how to cook quinoa, I followed the instructions on the package accurately. I ended up with mushy quinoa and I wasn’t thrilled with the taste or texture. But since then I have figured out the perfect water to quinoa ratios based stove top and Instant Pot cooking techniques. The stove top technique will use a larger quantity of water as compared to Instant Pot Quinoa. This is because cooking in a pressure cooker doesn’t allow water to escape when compared to cooking it on the stove. Light and fluffy quinoa each and every time! 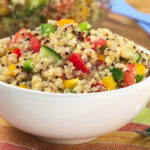 But if you cook quinoa following the recipe below it will always result in light, fluffy, and perfectly cooked quinoa that you can eat fresh or use in other recipes. Quinoa is a healthy super food that can be cooked on the stove top or in the Instant Pot and will be light and fluffy each and every time! Pour the quinoa into a fine mesh colander and rinse under cold running water for 1 minute, shaking as it rinses to allow all of the quinoa to be rinsed. Drain well. In a medium size saucepan add the rinsed quinoa and water/chicken broth. Bring the mixture to a boil over medium-high heat. Once it begins to boil reduce heat to a simmer. Continue to cook until all the water/broth has been absorbed. This will take approximately 10 minutes. 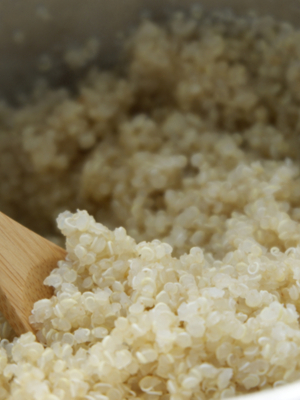 As the quinoa cooks, gradually reduce the heat setting to maintain a gentle simmer. Remove the pot from heat, cover, and let sit untouched for 5 minutes. Remove the lid and fluff the quinoa with a fork. Add 1 cup of water to the liner of the Instant Pot. Rinse the quinoa for 1 minute in a fine mesh strainer. Add the rinsed quinoa and 1 cup water/broth to an oven safe bowl that fits in your Instant Pot. Add a trivet to the Instant Pot and place the bowl on top of the trivet. Lock the lid in the sealing position and Manual/Pressure Cook for 1 minute on High Pressure. Allow for Natural Pressure Release for 10 minutes, then quick release any remaining pressure. Fluff with fork, and season with salt to taste. To intensify the flavor of the quinoa, toast it in a skillet or on the saute function of the Instant Pot for 3-5 minutes. Use cooked quinoa as a side dish, in other recipes or freeze for later use. I am confused about the toasting. Do you toast the quinoa before you rinse it, or after? I would think that wet quinoa would have to dry before it would start to toast. Or does the toasting time you use allow for it to dry first and then toast? I have been a fan/follower of Old World Garden Farms for quite a while, and just found out about Make Your Meals today. I subscribed immediately, and I am so excited to explore more of your great, practical recipes! Thank you so much Joanne for following Make Your Meals. 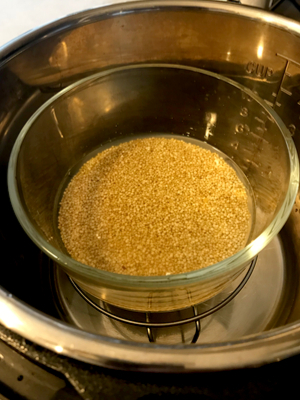 About the quinoa process, I rinse and let sit for a few minutes to drain while the Instant Pot is heating up. Then I add the oil and quinoa and it both dries it out and toasts it completely. It makes such a difference in the overall flavor! Hope that helps! oil is not mentioned in the ingredients or instructions for the toasting in the Insta Pot. About a Tbsp? Actually no oil is necessary. Just toast it on the sauté function for 2-3 minutes or heated in a nonstick skillet.